Integration of SkyBell HD Wi-Fi video doorbells with Apple HomeKit via a plugin for Nick Farina's Homebridge. The camera can be viewed either as snapshots or live video, the latter including audio from the SkyBell microphone. Supports configuration of the LED, indoor chime, outdoor chime, and motion detection. Also generates events for button presses and motion that can be used to trigger rich notifications (with a snapshot image from the camera) and other automation. More information: Hosted on GitHub as homebridge-skybell. Logging and web-based charting of temperature and heating activity data from Heatmiser Wi-Fi thermostats. Multiple thermostats can be logged and selected for display, and a variety of online weather services can be used log and overlay the external temperature. It also includes a plugin for SiriProxy that allows the thermostats to be controlled by voice commands from iPhone and iPad devices. The UK Met Office featured this software in their DataPoint showcase. More information: Hosted on GitHub as heatmiser-wifi. All of the software below is specifically for Acorn computers running the RISC OS operating system. I am no longer developing for RISC OS, so this software is provided as-is without support. Virtualise is the only general purpose virtual memory (VM) manager for Risc PC and A7000 dynamic areas. It includes a simple to use front-end that also supports suspending complete applications and swapping their state to disc. It was launched at Acorn World 1995 and marketed commercially by Clares Micro Supplies. A review was published in the June 1996 issue of Acorn Archimedes World. In December 2002 the sales and marketing rights were acquired by APDL who included it on the cover disc of Risc World magazine (volume 8, issue 2). Compatibility: Requires RISC OS 3.5 or higher. Not 32-bit compatible. Source code: Hosted on GitHub as riscos-virtualise. A suite of utilities for use with Acorn and Aleph One PC cards, as well as Acorn's !PCEm software emulator. It consists of a RISC OS module, a desktop front-end application, several DOS executables, and libraries for third party developers. Probably the most interesting feature is that it includes an DOS device driver that constructs a FAT filesystem on-the-fly to provide dynamic (read-only) access to the native RISC OS filesystems from within the PC environment. 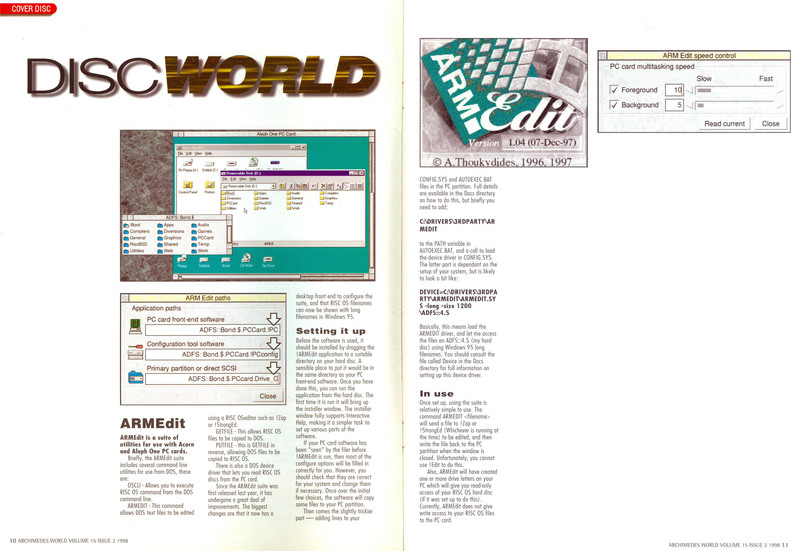 ARMEdit was featured on the February 1998 cover disc of Acorn Archimedes World. Compatibility: ARMEdit requires RISC OS 3.1 or later, and either PC front-end software 1.87 or above or any version of !PCEm. Performance is greatly improved when used with PCPro (!PC 2.02 or higher). Not 32-bit compatible. Source code: Source code could not be provided originally because it incorporates proprietary information received under NDA from Aleph One. However, this information has now been released under the GPL so the ARMEdit source code will be released soon. Display a banner window in the desktop, either for a predetermined length of time or until it is clicked on with the mouse. It is intended to be used while an application is loading, but may also be useful for other purposes. The layout of the window is specified by a templates file, which may include requests for text substitution from an optional messages file. Replace the standard mouse pointer by a more animated design that reacts to movement. It was inspired by Andrew Bolt's MouseP as published in the *Info section of Acorn User (June 1997). Compatibility: Requires RISC OS 3.5 or later. Not 32-bit compatible. This performs a similar function to *Desktop -file. The main difference is that each task is allowed to start-up fully before the next is started, and a limited degree of multi-tasking is available. The original reason for this program was to enable something more interesting than a blank grey screen to be shown while a lengthy start-up sequence is performed. Many other facilities were subsequently added, including a status window and a percentage completed display. Compatibility: Requires RISC OS 3.1 or later. A short utility that can be used to ensure that suitable versions of modules from the !System.modules directory are loaded. This is simpler to use than the built-in *RMEnsure command and provides friendlier error messages. Compatibility: Requires RISC OS 3.1 or later. Not 32-bit compatible. PsiFS is a filing system that provides access via a serial link to files stored on a SIBO or EPOC computer, such as a Psion Series 5, allowing them to be accessed just like files on a native disc. The standard Psion Link Protocol (PLP) is used; there is no extra software to install or run on the remote machine. It also supports printing from EPOC devices, using either the EPOC or RISC OS printer drivers. Other services provided include clipboard integration and battery monitoring. A plug-in interface enables third-party conversion utilities to be transparently invoked. 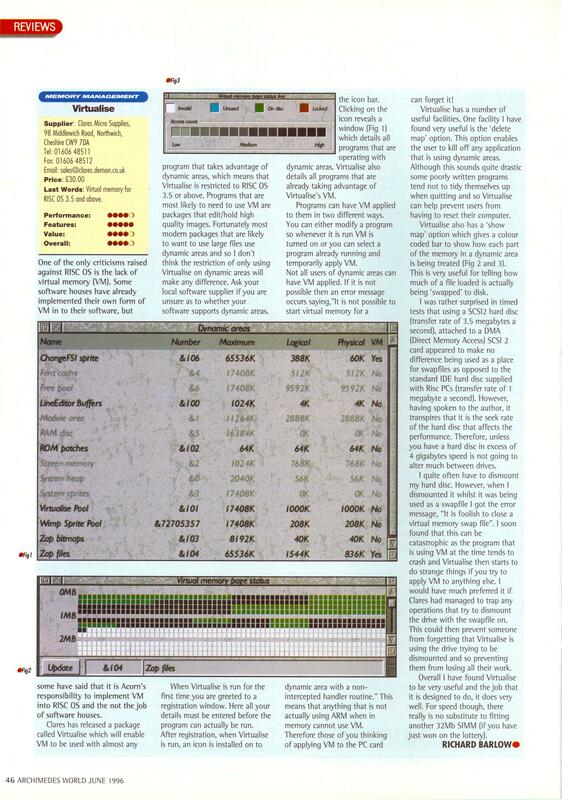 A review of PsiFS was published in the February 2000 edition of Palmtop magazine. Compatibility: Requires RISC OS 3.1 or later, a SIBO or EPOC computer, and a suitable serial cable. The version on this site is not 32-bit compatible. However, a 32-bit port for Iyonix has been produced by Jean-Michel Brück. A small module that displays more friendly dates in most applications, e.g. showing "Today", "Yesterday" or the day of the week rather than the full date for recent dates. A screen saver module for DarkHorse that displays a 6 plane parallax scrolling star field with various sprite objects (representing planets and the like) moving in front. Compatibility: Requires a copy of DarkHorse by Kuldip S Pardesi. A three dimensional version of noughts and crosses played on a 4×4×4 grid. This was written while I was still at school; the computer player uses heuristics rather than an exhaustive search but manages to play a surprisingly strong game. I didn't know it at the time, but apparently Parker Brothers produced a board game version of this in 1953 under the brand name Qubic. Compatibility: Requires RISC OS 2 or later. Miles Sabin's implementation of the Standard C++ Library is also available from this site. He allowed it to be released more or less as-is on the condition that he is not asked for any help. It is required to use the source code for PsiFS.